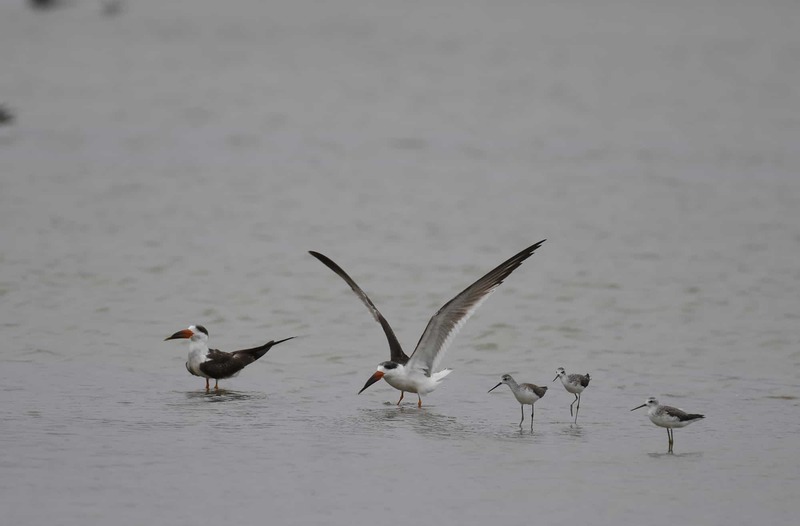 The annual winter migration of the Indian Skimmers carried them further afield, all the way down to the southernmost tip of the Indian subcontinent. A bird of north Indian waters, the Indian Skimmer, can now be seen in the southernmost tip of mainland India. Indian Skimmers dwell along the waterbodies in northern and central India, primarily in river Ganges and Chambal: They nest in the sandbars, shores and islands, and breed during February to June. There are three species of skimmers in the world – Indian Skimmer (Rynchops albicollis), Black Skimmer (Rynchops Niger) and African Skimmer (Rynchops flavirostris). While the Black Skimmers are distributed in America and the African Skimmers in Africa, the Indian Skimmers are found in India, Pakistan and Myanmar. Skimmers are unmistakable birds. Though they are gregarious beings, socialising with other bird species like terns, Skimmers can easily be made out from the flock. They are black above and white below, have long pointed wings, short tail and legs. Their mandibles are matchless – long and thick, laterally compressed, and brightly coloured. There are three major features that distinguish skimmers from other birds. One, they make agile flights. Two, unlike most other birds, skimmers have vertical slit eyes, similar to cats. This allows the bird to hunt its prey even during low light. And three, their lower mandible is longer than the upper. On the onset of winter, Indian Skimmers migrate locally, visiting the west coast of India, from Gujarat to Goa usually. But in the year 2017, probably for the first time, a small flock arrived as far as Kanyakumari in Tamilnadu where mainland India ends. Puthalam (8°06’33.7″N 77°28’23.0″E) which is about 10 km northwest of the popular destination of Kanyakumari, is their new home. It is a small hamlet known for its far-flung salt pans. With an area of over half a square kilometre, the salt pans in Puthalam act as a crucial habitat for diverse birds, especially in winter. Flamingos, ibises, pelicans, storks, terns, plovers, stints, ducks, egrets and sandpipers are some of the birds that take refuge here. Dr S. Balachandran, Deputy Director of Bombay Natural History Society (BNHS) whose hometown is just 5 km away from the Puthalam makes it a point to visit the wetlands in the region often. He monitors the birds here – does the headcount and records the arrival and departure of migratory birds. On October 03 last year, he was in Puthalam for a regular bird survey. While taking note of the hundred plus Greater Flamingoes and plenty other waders, he heard the strange “kip..kip” call and searched for the direction of its origin. He had heard it earlier elsewhere, but certainly not in the southern region. That was a small flock of blackbirds hovering in the sky. The flight pattern and call suggested to him that these were not the resident birds of the region, neither he had seen them at Puthalam or nearby in habitats in the past. Trying to figure out the species, he kept the birds in sight and waded towards their direction in the knee-deep water. He saw them settling afar off along with a flock of terns that were roosting on a small bund amidst the brackish water. Dr Bala moved fast towards the birds and stopped at another bund from where he could clearly see the birds through binoculars. The magnified view gave him a clear picture of the bird, making him gasp in awe. He looked at the birds, again and again, to confirm his deduction, concluding that those blackbirds were indeed Indian Skimmers. The duo began their peculiar ritual of skimming for which the birds are known. They flew inches above the water and preyed on the aquatic insects near the surface of the water by ploughing through the water. With the lower mandible longer than the upper, its scissor-like bill makes it possible to catch the prey while flying. The bird keeps it bills open and the lower mandible slices the water. As soon as the lower mandible touches the fish, the bird bends its head downward and traps the food in sideways like a scissor. Indian Skimmers were abundant once. But today, only 4000-6500 mature individuals are left worldwide according to the Birdlife International. In India, it is just 2500. The International Union for Conservation of Nature and Natural Resources (IUCN) has classified the bird as a “Vulnerable” species as its population is declining drastically, a direct consequence of widespread degradation and disturbance of lowland rivers, lakes and other wetlands. It can be conjectured that this could be a reason why Indian Skimmers arrived at Puthalam. When habitats in their range are either put down or disturbed, birds explore new areas. Perhaps, the Indian Skimmers might have arrived in southern India, beyond their distribution range, looking for new habitats. 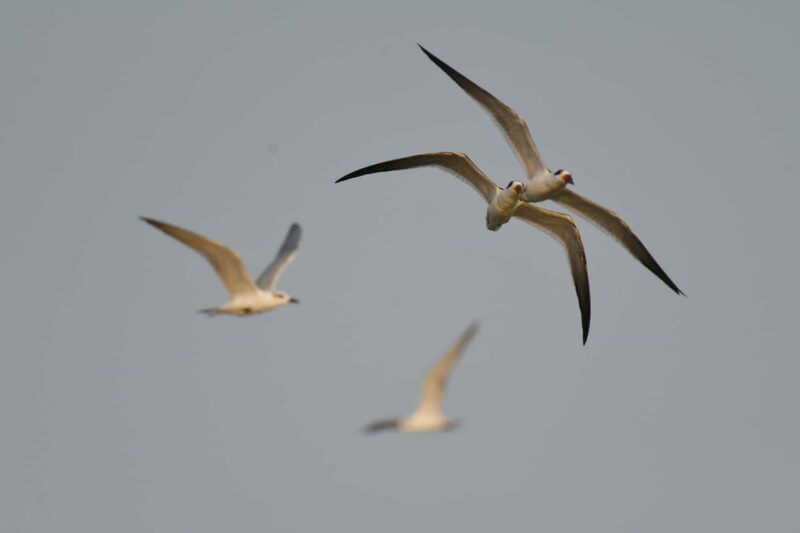 Another reason could be, according to Dr Bala, that since Indian Skimmers are social birds that live with other species like terns, some of the skimmers could have migrated here along with the sympatric species like terns. In any case, it is good to see Indian Skimmers in the southern region of the country. Although we feel happy when we see a new bird in a place, what made them visit there remains a puzzle. All we can surmise is that nature is always supreme, and far beyond human intellect most of the time.